Contact Recents - Unified timeline grouping all events with a contact, accessible through the Recents list. Ability to copy & paste numbers and addresses. Ability to access contact Recent History from the Contact detail screen. Grouping Recents and events by date/time grouping. What's New - An easy way to show our users new features released in the app! User stuck in On Hold status. Editing contacts with multiple numbers. Ability to access contact Recent History. Recents list and homepage swipe actions. We have reworked our email notifications for voicemails, moving from plain text to html emails. When a call is retrieved from a call parking spot, the Caller ID displayed is the one of the person who was parked the call instead of the number of the parking spot itself. Once the warm transfer is completed, the incoming caller's Caller ID is displayed instead of the Caller ID of the person transferring. Corporate Directories no longer display "Only Polycoms support TLS" to reflect that you may now enable TLS on Cisco MPP, Yealink, AND Polycom devices. One-way audio issues, where one participant couldn’t hear the other. Contacts not loading more than 100 contacts. Voicemail message notifications delay on home screen. One-way audio issues, where one participant couldn’t hear the other over T-Mobile network. Not consistently receiving calls and their notifications. Inability to get a call off ‘Hold’. Ability to enable the speaker prior to call being connected. UI updates to ensure consistency across the app and compatibility with different iPhone screen sizes, along with updates to the general experience and transfer flows. The Cisco 8845 and 8865 with Multiplatform Firmware is now supported on the Jive platform. These devices can be provisioned the same way as other Cisco 68/78/88XX devices. Deny strict configuration has been fixed to rejects new callers when no agents are available, not just when none are present. Fixed the issue where loading many SMS and chat messages cause Jive Web to become unresponsive. Calling a user with multiple extensions selects the proper extension and not the first one of the user. SMS is now in public beta and can be enabled by administrators. Settings page now has a responsive design. As a result of feedback gathered during the User and User Logs reports beta, we created the User Activity report as a replacement for User and User Logs reports. User Activity reports serve a larger set of people than did the User and User Logs. The Dial page now defaults to the dialpad instead of the contact search. Numbers are parsed correctly when including parens or hyphens. Dialing * and # in the call page is now supported. Fixed voicemail badge appearing in top-right corner instead of on the button. Token refresh now correctly restores query parameters when redirecting back to the app. Left side menu is now responsive for mobile. Enable the “Call” button in dialpad mode when a number is entered. Make sure to return an error when no auth info is available instead of succeeding with an undefined object. New contacts search for searching and calling a contact . Fixed width breakpoint discrepancy between Firefox and Chrome. Integrations are now moved from settings to a separate app (in app-switcher). Voicemails now play in the selected output device from Settings. Added the Fax tab to a Line profile. Added to Yealink the ability to register 8 handsets at once on a single Yealink W6OB. Searching by number sets the first result to that number. Tab key now selects the highlighted contact. Whenever you add a shared line button to a button configuration device, it will automatically update the device to use presence. Removing all shared line buttons will allow you to edit that button again. Added a shortcut to GoToMeeting for users that have an account. Contacts created on Mobile can now be edited in Jive Web. The Polycom Skyline (VVX) 250, 350, and 450 are now supported on the Jive platform. Settings menu now appears when clicking on the settings button. App switcher included in sidebar navigation. Created a send message field. Language options moved to the settings menu. Added a badge showing unplayed voicemail count. Users can now search their contacts by name or number from the new message screen. Users can now send SMS messages to unknown contacts. New message page now allows users to search personal contacts. Keyboard based navigation can is now available on the new message screen. Polycom devices will now use the on phone directory for caller id lookups. You can now label a button on a phone to use the line name rather than a custom label. As such, anytime the line name is changed, the button label for all phones that use that line will be automatically updated. Email addresses (JiveIDs) with a “+” sign are now accepted during registration. Polycom devices previously only displayed the extension number for Lines and Line (Silent) buttons. They will now display whatever label is saved in the portal. Users are notified days in advance to renew their authentication to prevent being logged out during a call. Enabled the ability for users to set up their phone buttons from Jive Web. Polycom Trio 8500 is now a supported Jive device. Fixed the warning if you are navigating away while on a call. Unconfigured users will now be redirected to Jive access error page. http 401 interceptor added with redirect to login page. Chat can be scrolled properly for long conversations. Cisco MPP devices on 11.1.2 firmware will no longer interrupt an active call when receiving a multicast page. Android 3.2.1 release includes bug fixes and performance improvements. Fixed an issue which occasionally caused the application to load incorrectly. Fixed an issue where click to call wasn’t working consistently. External numbers can now be added as a ring step in your Find Me Follow Me settings. Fixed a bug where a successful transfer resulted in a transfer failure message. Fixed a bug where field widths were not resizing properly when resizing your browser window. Fixed an issue where Automatically Authorize Network With Provisioning was not working in some situations. Removed the ability to edit a JBC device inline (i.e. we removed the pencil icon). Fixed a bug that excluded some extensions while adding a speed dial key to a phone. Updated the checkbox style to match all of Jive. Integrations are now hidden if there are no accounts available. Added end of life message to jive.me. May it rest in peace. Added a warning prompt before you leave the app during a call. Made sure the application language is initialized before starting to use translations. Fixed an issue where button labels were not appearing correctly when customizing your phone’s buttons. Fixed call controls for 3-way calling. Added Find Me/Follow Me to Settings so you can setup your personal dial plan. Fixed a bug where the new voicemail badge was appearing even though you didn’t have a new message. Removed the beta tag. Jive Web is no longer in beta… Hooray! Fixed an issue where calls to the same contact were not properly displayed and handled. Grandstream and Panasonic TGP phones can now add the correct number of lines. Jive Web now loads completely before you can use it. We created a nice load graphic for you while you wait as well. We added and improved a network quality indicator to let you know how strong your connection is while on a call. Fixed a bug where sound effects (like hangup and ringtone) were playing through the wrong audio output source. Fixed the tool tips for downloading Jive Mobile for iOS and Android. Fixed a bug where the dial tone and ringtone were overlapping while making a call. Fixed a bug that prevented the creation of new users. Fixed a bug that caused a user to lose control of audio when marking a message as played while listening to it. After, trying use the audio progress bar would close the visual component. Fixed an issue where chat messages from former users were never marked as read. Voicemail no longer keeps playing after clicking “View” or “Call”. Fixed a bug that prevented some users from logging in. Priority and Importance fields are now available when saving an activity to Redtail. All Polycom SoundPoint IPs (and their sidecars) on firmware version 3.2.7 or greater now support the ability to customize buttons from Jive Administration. Added the version number in the menu. New Silence – No Sound music option added the Built-In Hold Music Playlist. Fixed a bug that prevented notification of incoming SMS messages. This fixes both the OS level toast notification as well as updating the message badge count. Updated Authentication specs (OAuth2) with Authroization Code Grant Flow. Yealink CP920 is now an officially supported device. Fixes an issue where double-clicking the Accept Call button would drop the call. Cisco MPCC devices were displaying time incorrectly, as if Daylight Savings Time was activated. This issue has been resolved. Aastra devices now support Multicast paging buttons for outgoing pages (limited by the amount of buttons on the phone) and Multicast listening (limited to 5 total listen zones). Assign the Paging group to the device and then you will have the ability to select the zone on the Button Configuration page. Listen zones will automatically be added to the device from the first 5 zones listed as “subscribe” in the assigned group. The Aastra 6867i is now supported in new provisioning. This allows the device to get a remote directory and configure speed dial, BLF, and Multicast Paging buttons in the portal. Fixed a bug that was causing caller ID to be incorrect. Disable voicemail settings for lines with a shared voicemail box. Fixed an issue that caused multiple calls to be made if the call button was double-clicked or clicked more than once. A friendly message is shown to user in case of a server error. Manage your voicemail messages faster with visual voicemail. Fixed bug where lines that used the PBX Default as their Region, could not change their Local Area Code. Fixed bug with JBC device provisioning settings. Fixed issue with Brazil and Mexico phone numbers. Participant.number is no longer formatted as an e164 number. Fixed redirect issue when attempting to log in with Microsoft credentials that do not match your JiveID. The export users .csv now has the billing group listed as “Master” when no billing group is present, rather than having an empty cell. Cisco devices were sometimes displaying a long alpha numeric display name (station label). This issue has been resolved. Having issues getting rid of last year’s music? Shouldn’t be anymore– as we’ve exterminated the bug that kept throwing up errors when you tried to delete a hold music playlist. Fixed bug where potentially invalid local area codes were allowed to be assigned to a line. The Yealink W60B is now a Jive supported device. Cisco 6841 and 6851 devices are now available in Administration and Provisioning. Need to delete a Call Queue? Don’t want to have to handle the tedious task of removing all the agents in it first? No worries! We’ve shifted a few things around so that you can skip straight to just deleting the queue. Previously, on some Cisco MPCC devices: If a Corporate Directory had a blank value in the portal, provisioning could fail. Spoiler alert: This issue has been fixed. Looking for more customization in your Fax to Email settings? You’re in luck! We’ve just added the ability to do exactly that. Remember how the Call Controls wouldn’t show up if you’d enter a phone number with dashes or parentheses? Well, either way, there’s a reason that’s all being stated in past tense. Cause that doesn’t happen anymore. The Grinch has returned with our Christmas trees now that the lights have been fixed. After some negotiating with the Developers, he has also returned the ability to record and upload voicemail greetings. The Voicemail API was having some issues that resulted in Bartholomew Cubbins and company to get a 500 error to go with all the hats when they went to listen to their first-ever voicemails. This has since been resolved, and now Mr Cubbins just has to figure out what to do with all the hats. The Android powered Yealink T58V is now supported in provisioning and in the Online Portal. Need to adjust the base volume of a sound clip? We’ve got you covered. We’ve just added the ability to choose the base volume of a sound clip, hold music file, or outgoing voicemail message when it is uploaded into Admin Portal. So, ya know how the Portal would tell you there was an error saving after converting a Polycom to button configuration? Well, that won’t be a problem anymore. Good times. Cisco / Linksys SPA devices that are on a firmware lower than 7.5.2b were unable to upgrade to a Jive supported firmware without first upgrading to 7.5.2b. When provisioning to Jive, we will now automatically do this if we detect it is on an older version. After a little finagling to line up the perfect photo op, we’ve got the voicemails right where we want ‘em– where the new voicemail will be first in line. Sorry about the crowding and blocking earlier. Have you had trouble with hearing dead voicemails? If so, never fear! Once you consign a voicemail to sleeping with the fishes via deletion, it’ll stop playing, and not try to continue after it’s gone. The Cisco Remote Directory can now be activated from the administration portal. To enable, go to Devices, navigate to the device, select “Button Configuration” and then check “Enable Remote Directory”. You can select “Save” and manually power cycle the device, or select “Save and Resync” to force the device to get its provisioning now. Once enabled, this directory can be accessed by pressing the Directory button on the face of the phone. JBC – Jive Business Continuity– can now be managed in Admin Portal! A Default JBC can be set for an Organization, an override JBC can be set per device, and Admin changes can be made to the JBC configuration. Please note: As hardware is involved, Admins cannot create a new JBC just yet and there are some details you’ll still need to contact Jive Customer Care to manage, but, much is now in your hands. In dial plans, references to entities such as sound clips are no longer cleared on export. We’ve added the Visual Voicemail feature. Now when you click on the voicemail item in the left navigation menu, you get a list of your voicemail items in descending order by the date they were created (newest on top). From the list you can listen to your messages, delete your messages or mark them as played or unplayed. Push notifications ensure you receive your calls without requiring a persistent battery consumptive SIP connection. Calls with reach you whether the app is running in the background or completely shut off. Push notifications will wake the app and allow you to take your call. We’ve added the ability to set Do Not Disturb for a specified amount of time. So you can set it and forget it. The battle squad deployed to eliminate the bugs keeping you from loading some data into the End User Portal has returned victorious. Order in the Portal! The order your hold music is listed in its playlist can now be adjusted at will. Just drag and drop a song into its new place. We have awoken the wizard to stop spell that kept the brooms dumping voicemails into the well of deleted files when you just turn off email notifications. This misunderstanding of “no notifications” meaning “I don’t want this voicemail at all” will no longer be a problem. The Polycom Trio 8800 has can now be provisioned to our system! Yealink T32 and T38 devices previously were not able to utilize labels on line keys and speed dials. This has been fixed and the device will now reflect the information saved on the Portal. Language lessons for the code monkeys are progressing, so when you arrive at the JiveWeb landing page, the welcome message will be translated into your preferred language. Messages letting you know that your Messages, Calls, Voicemail, and All activities will now be displayed when these are, in fact, empty. File selectors for sound clips and hold music now allow MP3 uploads! Have at it! Prepare to rock out: Uploading ginormous sound files takes a little while to normalize and transcode, so we were timing out prematurely. This has been fixed, and longer mp3s now work! Secure Calling and Hot Desking are no longer in Beta, so the portal now shows this on those features. The Beta tag has been removed. Whenever you save note in an invalid current page, and then try to save the note in the correct, only the correct save will be appended to note. When the sales agent call to a customer the pop up immediately starts to count the time of the call instead of wait until the customer answer the phone. Sprayed for bugs that resulted in Extension Mappings not being displayed in admin portal. Squashed a bug which kept the LLDP and CDP toggles in the System Settings from saving correctly. Minor bug spraying concerning issues with chat abilities. When opening a new Salesforce tab from the History view, the Jive extension will remain on the History view. In a continued show of good feelings between America and her former Imperial homeland after the rather messy divorce of 1776, we’ve mended a few fences and bugs that made dialing UK phone numbers difficult. Polycoms have been issued anti-nausea pills to fix the bugs that caused some to restart in the middle of the day while checking for updates. Fixed an issue that kept Cisco devices hooked into networks with MPLS circuits from registering. Shared Line Appearance is now in Public BETA. When your token expires, the application will retry again once before logging you out in order to generate a new token. Fixed an issue with permissions where some users couldn’t access the new Supervisor Page, which is currently in Beta. Intermittent issues in exports may lead to an error message in the browser. Queues with “Deny” selected for Allow new callers into empty queue do not count calls that were not allowed into the queue as evicted contacts. This issue may be avoided by setting Allow new callers into empty queue to “Permit” and selecting * “Remove Callers” for Remove callers when queue has no agents. This configuration also causes the eviction of all calls from the queue should there be a period during which no agents are logged in to the queue. The Wallboard page displays a white screen while loading on a Chromecast. The Wallboard page displays a “414” error message if more than approximately 80 queues are selected for display at once. We’ve rolled out our new Real Time Supervisor page for a limited number of customers in a private beta. Looking for your device’s model number? We’ve added it to the top of the Device page — no more having to go to the Hardware tab. Polycom users, lend us your ears! In order to provide some closure, we’ve added toggles in both the Device General Settings and PBX System Settings that allows Admin Users to switch between LDAP Background Sync or LDAP Directory View Persistence. On the User List page, we’ve planted some new fields for the User Exports. Among the new crops of information to be harvested are Permissions, Location, Billing Group, and a variety of DIDs. Edge users– we’ve added support for Admin Portal on your browser of choice, so, if you head over to the shelves containing Hold Music and Sound Clips, you’ll find that you can now play and preview the files. Fixes an issue that prevented a fax machine on a Jive PBX from sending a fax to an extension on the same PBX, while Detect Fax was enabled. Cisco 88XX/78XX: We’ve set the “Call appearances per line” to 10, which will allow each line to have 10 calls (up to 5 has been tested). If the device has the same line more than one time, we will set the line mapping to “Vertical”, which means that calls will fill in from top to bottom. When pressing the Directory softkey on Yealink devices, you will now see a list of available directories depending on what you have enabled. Both your Remote Directory and LDAP will show here– no need to look through the couch cushions. A feature has been added to New Portal under System Settings >> General, which allows Admins to configure the devices on their PBX, whether the device uses either/both CDP and LLDP. Currently, it is set to “Use Device Default”, and will change once you select whether it’s Enabled or Disabled to a toggle switch. As usual, we advise against Admins using the big red button to their left unless absolutely necessary. Hot Desking is now available as a public beta for everyone! We’ve added ability to manage buttons on Panasonic UTG devices in New Admin Portal, as you could previously with Old Portal. Custom setting overrides from Polycom devices can now be cleared from New Admin Portal. View the device’s Hardware tab in the Portal to manage these custom settings. Fixed issue in New Admin Portal that limited adding two instances of the same line to one device. Some devices would fail to provision if the network access list contained a public IP with a /0 CIDR notation. This has been resolved. We have successfully returned from our campaign into the far reaches of outer space to bring back your Admins, so the role will now properly appear on the User List page as it was meant to. In an effort to continue trying to make the transition to New Portal smoother, we’ve updated the voicemail settings to make the “Say message duration threshold” setting more in line with old portal. The Case of the Missing Users (which affected 0.4% of y’all) has been solved thanks to the efforts of Admin Holmes, his friend Doctor Portal and their team of intrepid programmers. We’ve fixed an issue that kept the virtual fax machines from being configured properly. They should have all of their facts straight now. BIG NEWS: As of TODAY, Legacy Portal is no longer available. Welcome to the new age of New Portal! Sometimes, X does mark the spot. Extension Mapping is now available in PBX Settings! This new tool will allow Admins to access their inner cartographer and create a list of patterns that will map to different extensions. Meaning, for example, you can set it so anyone dialing extensions 1230-1239 would be routed to ext. 1239. The exception for this would be, of course, if one of those extension numbers is already in use– say, ext 1234, or if there’s a more specific mapping rule in place. When clicking the “View” button for a contact from the Activity and Calls History pages, a contact is selected from the Activity and Calls History pages, you won’t be directed to the wrong contact that happens to have the same phone number anymore. T-Mobile support on cellular now available for the app. Launch of our new Abandoned Calls page, which features the Abandoned After Threshold (AAT) graph and a table of all abandoned calls including numbers to call back. Fences make good neighbours– so, we’ve made it so you can custom configure Acoustic Fences on Polycom by device in the portal. All the tools you need will be on a device’s General Settings page. Added TLS as a transport protocol for custom Outbound Proxies — ie we’ve added more secure ways for you to connect with us. You may have noticed that there was a bit of a conflict between network filters and your directories, provider, and extension configuration file– particularly Polycom devices. The internet filters would cause the Polycom device to receive a directory with the wrong file type, which long story short made configuring the phone a nightmare. We’ve fixed it so we will now clean up these directory files on upload and download, and things should be operating in a more dreamlike manner. BIG NEWS: As of August 15, 2017 Legacy Portal will shut down. If you haven’t checked out New Portal yet (and, really, how could you not? ), hop on in and get familiar with it! When setting up your queue in languages other than English, the duration selector now shows up and acts as expected for something of it’s position. Previously on Admin Portal: you weren’t able to delete a user from your PBX if they were associated with a device. This caused massive frustration because you needed to go hunting for whatever was causing the holdup. We’ve gone and made it a standup fight rather than just another bug hunt, by making this no longer the case. Fixed crash when starting the app experienced by some users. Fixed crash when loading contacts experienced by some users. You can now configure the Acoustic Fence feature on Polycom VVX devices on the General tab of Polycom VVX devices.This feature is enabled by default for all VVX devices. We’ve gone and zapped a bug that kept you from disabling the (Super Ultra) Mega Paging Volume option on Yealink devices. You can now make sure you’re adding the right clip to your dial plan by previewing them on both Admin Portal or the Dial Plan Editor. Need to request a number transfer? We’ve added a quick link to do just that on the Phone Numbers list page on Admin Portal. Fix an issue which caused tooltip artifacts to remain drawn on screen while viewing graphs. Fix bug which caused graphs to crash when displaying large data sets. The Queue node in the Dial Plan Editor lost its “on timeout go to” label a while ago. We swept underneath the fridge and found it, so it’s there again! Incoming calls that follow a line’s dial plan off the PBX will adopt the PBX’s caller ID unless your line dial plan says to do otherwise. Might not be an optical scanner, but we’ve adjusted the Network Access Permissions page so it’ll check if the IP you’ve entered is valid. No worries, we’ll let you know if there’s an issue. On the Network Access Permissions page, when editing a network access permission, new validation has been added to the network field. We’ve also added in a date picker for the expiration field, for when you’re editing network access permissions. Slight changes to the URL for your PBX have been made, namely your domain name is now part of it. Don’t worry, if you’ve got the link bookmarked under the old style, you’ll be redirected to where you’re trying to go automatically. Sound off! We’ve got a new round of ways to record and include sound clip options! Just, keep in mind that these new options aren’t supported on IE and Safari. If you forget, we’ll remind you. New sound clips can be created via ‘Record’ button on Sound Clips list, or via the dropdown menu. A new greeting can be created via Voicemail/Outgoing Message options on a line/ring group/shared voicemail box’s detail page. We’ve launched a re-implementation of our graphs and fixed the issue when visualizing a line of zero values, where the last data point in the Historical Contact Resolution report would be offset to the right. Mended an issue where attempting to go to your voicemail would lead to an Invalid Extension error. You’ll now be notified when a new contact has been created, so you won’t have to worry about accidentally creating duplicates. We’ve made some updates to the look of the dashboard and left panel. We’ve zapped a bug in New Portal that prevented customers from entering valid Mexico area codes. 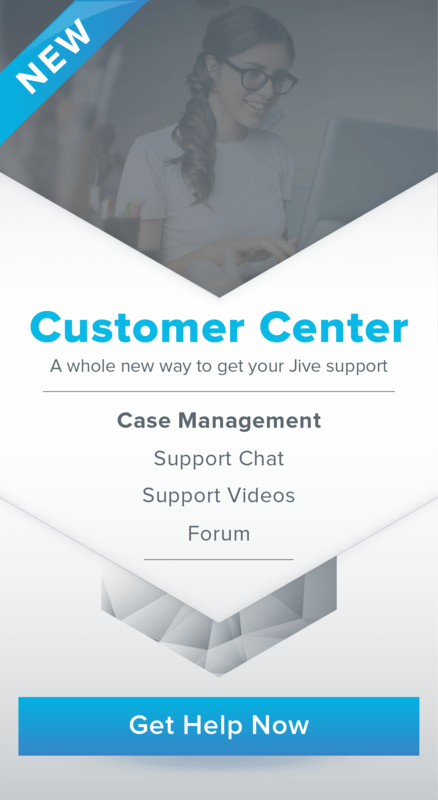 SalesForce LiveAgent is the new way where customers can chat with Jive Support Agent. LiveAgent button shows up on Admin Portal when one or more agent is online. This option is only available in English, and for users in the US and Canada. If you’re in need of help, an option to chat with one of our Customer Service agents will appear on screen within two minutes of you navigating to that page. The exception to this rule is if no agents are available at the moment, in which case the option won’t show. Limited release of re-implementation of graphs for a small number of customers, testing UX improvements including a fix for a Known Issue where the Historical Contact Resolution report is offset to the right. When visualizing a line of zero values, the last data point in the Historical Contact Resolution report is offset to the right. We’ve made a few small changes to the Billing Portal URL in order to make getting around easier, instead of having it be like trying to follow Jeffy around a Family Circus comic. We have added support for the following Cisco 7800 series devices, and they are now available as devices in the Admin Portal. We have added support for the Cisco 8800 series devices, and they are now available as devices in the Admin Portal. When you’ve logged in, the Jive icon in the top right of your screen will turn green. If you haven’t been authenticated or if you’ve logged out, the icon will turn grey. Three-way calls: We’ve improved the three-way experience. Excuse a single participant individually from the right panel participant list. Extension/Device selector: Select or switching your extension and device is moved from the top right drop down to the bottom of the left sidebar. Call Dialpad: When a user clicks on the top navigation call button we now default to the dialpad. If the users starts typing from their keyboard we automatically switch to the contact search list. Audio Settings: We’ve updated the Audio setting user interface. If you’re using a US-based phone number, you can now dial Puerto Rico without needing International Dialing permissions. We’ve fixed a small issue that temporarily made it so PBX Admins couldn’t see the Permissions settings in New Portal. We apologize for the inconvenience. Trying to add custom emergency numbers and their email addresses was a confusing experience. As it shouldn’t be, we’ve fixed the issue that caused it to be so. Some users were finding that using *67 while Call Recording was enabled would previously result in an error. This has since been fixed. Transitioning from one network to another while using Jive Web is now easier, as we’ve added the capability for the audio stream to follow you, thus keeping you from losing the call while on the move. Moved the incoming call notifications to the center of the screen. To help you know what line you’re on and reduce any confusion, we’ve moved the device selector to the bottom left corner. Added the ability to save notes to all four types of accounts (Accounts, Leads, Contacts and Opportunities). Unanswered outgoing calls displays a pop up with the message “Dialed number is busy”. Applying polish to pre-existing features. Resolved an issue that was causing Jive Web to lag when a call ended. Mended an issue so contacts will no longer appear twice in the History section of the left sidebar when on a call. Fixed notification sounds not working when receiving chat or sms messages as reported by some users. Fixed issue where the “call notification” would interfere with the “call screen” and it was hard to pick up the call in some instances. Fixed issue where sending a chat message or sms would not immediately appear on the conversation. The Jive app will not work for LENOVO devices under “Secure Zone.” Remove the app from the “Secure Zone” to continue using it while we investigate the issue. Added the ability to assign devices and DIDs to user-defined billing groups. Please note that this is a specialized capability that must be activated by Jive. Partner Portal now has a link to the network testing tool that can be found on the menu on the left side. Fixed bug that resulted in a 500 error when saving users. Note, that is a 500 error, not 500 errors, miles, days of summer, or a miscalculation of Spartan troops. User Groups that have been deleted still showed up in the list view of other groups that they were a part of until refresh. Vampire slayers have been dispatched to deal with these pesky undead, and they should no longer be a problem. Added a toggle-able dial pad to the call page. Fixed an issue where voicemail waiting badge/count was loading indefinitely and didn’t show the count. Updated left navigation recent contacts list to update the most recent contact immediately after a call or message. Call duration added to Call History. Contacts added to local storage to improve performance. Corporate (LDAP) directories are now provisionable on Cisco CP devices. Assign the corporate directory to the device profile like you would for any device. Once you do this, the directory soft key can be used to access it. Previously, when you pressed the “Forward” button on Cisco CP devices, it would play a loud high pitched prompt tone that made everyone think of the mermaid song from Harry Potter. This has been replaced with a normal dial tone to match other phones and should no longer be deafening– putting your phone underwater will not be necessary. Most Device Details pages now have a “Usage” tab, which indicates where other resources are referencing the device you’re looking at. Our End User Portal would occasionally bring up a synchronization error regarding Visual Voicemail. We’ve gone in and fixed the error. Fixed a bug that kept the copy to clipboard links for SIP credentials and Conferencing URLs from working properly. Fixed Bug that kept the Device pages from loading and saving information properly. The Override dropdown menu on Scheduling was blank when creating a new schedule. This is no longer the case. In Settings, the search function for Time Zones was a pain. We’ve fixed it so it shouldn’t cause more problems, and everything should be much easier now. Dropdown lists for Hold Music now have a link icon that will take you to that hold music playlist. Fixed a bug that prevented saving a Default Corporate Directory in System Settings. The Algo 8036 is now officially supported and available as a device in portal. Yealink T41P and T42G’s were not properly displaying their respective number of lines available. Now they are. VTech conference phones will now indicate if there is voicemail on the extension. Fixed a bug where using the Buddy Watch or BLF toggles in Portal wasn’t updating the labels correctly. Fixed an issue where the Queues drop-down didn’t render properly in Chrome 57. New toast notifications that allow multiple notes, etc, to be shown as “Saved”, etc. Improved the response performance and reliability of the app. We’ve added nitro to our system so everything loads faster now. The Apex class is no longer required in order to add or create a new contact. Added ability to handle multiple incoming/outgoing/active call notifications. We’ve tinkered with Call History to get the list to update in realtime for every call event, and more clearly defining the Click to Dial and Call Direction icons. Chrome’s update to version 0.57 made it difficult for Jive Desktop to continue working properly. We’ve updated and made amends as necessary to get the relationship back to a healthy place, and Jive Desktop is back online. Your Admin Portal will now validate country area codes entered in both the System Settings and Line Detail pages. Parking, on the other hand, not so much. New button unlocked! PBXs set for the US region will now have a button displayed on the DID list page. This button links to our Number Ordering Tool, which will open in a new tab. If you click on an entry in a list there is now a ‘Return to List’ button in the top right. Hoping we’re not pressing your buttons here, but we’ve added “Previous” and “Next” buttons on the Details pages now, so you can switch between items and won’t have to go back to the main list page. There will also be an indicator letting you know what page you’re on, ie 2 of 10. We’ve enabled a new PBX Files Service that will allow for mp3 uploads and will normalize the volume of all uploaded audio–no more unexpected audio assaults via the headsets. The User page thought that you needed to save after showing your password. It was wrong. We’ve made adjustments so that shouldn’t bother you again. We’ve reworked some of the wording for line dial plans to allow for greater clarity. We’ve fixed a bug that caused some calls to have their caller ID blocked by mistake. Loud and Warble ringtones have been added to Polycom devices. These will download automatically to the devices, for whenever you’re ready for them. We now support the Message button for VTech devices. Regions and time zones are taken into account when deciding on time and date formats for VTech devices. We are happy to announce that the timeout issue when converting large directories to button configuration has been resolved. Fixed a bug where the last data point in the Historical Contact Resolution graphs could have an incorrect x-axis label. By popular demand, we’ve lengthened the potential timeout for call queues to 8 hours. You can adjust when a call can time out of the call queue in the Dial Plan Editor. A Shared Voicemail Box’s details page now list the extensions that are attached to the box in question. Fingers flying ahead of your thoughts? The login on Portal will prompt you with possible corrections with common errors like “gnail.com” or “.cmo” when you’re typing in your User ID or email. Join the international party line! Puerto Rico, Canada, and the United States can now call each other as Domestic Long distance instead of being considered an International call. Previously, only Canada and the United States could do this. We’ve added a setting to help optimize fax support in New Portal, which we’ve aptly named….the Fax Optimization Selector. If it’s supported by the device in question, you’ll find it in the Devices page under the Hardware tab. Adjustments in order to make your life easier have been put into operation! You can now route your numbers with in-line editing from the Phone Numbers list view. An extension or another internal phone number can be selected. Feel free to ditch the astrolabe– your life just got easier with our upgraded navigational style. With the exception of the Permissions pages, the lists of items in New Portal now link to what the list is referencing. A new flag has appeared on various extensions! “Omit from Auto Attendant extension dialing” prevents the extension from being dialed by number in an auto attendant step of a Dial Plan. This is particularly handy for new extension-based security measures, such as on the Algo devices. We’ve added a few warning labels to ring groups to let you know when you’re about to overload one with too many users. Now when sharing links to the hold music playlist page, the playlist/music list selected will remain highlighted, instead of switching back to the default. Network permissions, as listed under Network Access and Devices, has a list of IP Addresses. We used to have those sorted in a way that war far from optimal–so, we changed the rules a bit to fix that. To avoid being fined by the Grammar Nazis in our lives, we fixed a spelling error in emergency alert notification email. We’ve added a confirmation pop up for when you’re deleting Outgoing messages for voicemail. Just in case. We’ve improved the Combo wizards hardware assignment flow in order to make it easier for you to either create new hardware or find old hardware without getting too lost. We also fixed a but that would have prevented you from progressing if you had previously entered an invalid mac address before selecting an existing hardware. Getting out of bed in the morning the week after Daylight Savings begins can be a drag–even for the New Portal Schedule. We’ve supplied it with enough caffeine, however, that it is no longer trying to start an hour later than it should. Zapped a bug where dial plans were trying to direct to an extension, play a sound clip, etc, even though the item in question had been deleted elsewhere in New Portal. Previously, when trying to park a call where another call is already parked, the calls would be bridged, which results in less than favorable circumstances. Now, the second call will immediately be returned to you. As a side effect, attempting to warm transfer to a static slot (e.g. when dialing *371) no longer works, and instead you’ll hear a message saying that no call is parked there. Fixed a bug in the Contact Center wallboard where the longest talk time widget wouldn’t show any data. Keeping it real: We’ve added new/more accurate invoice statuses on the Billing History pages. Customers can now pay the total of all their invoices with one click in billing portal. When customers’ accounts are shut off for non-payment, they will now see a message in the billing portal instructing them how to get it reactivated. We now support the Algo 8180 and 8186. We also now support the Algo 8128 Strobe and the Algo 8301 Paging Adapter. Right now the devices are only manually configurable, but we will be supporting central provisioning for them in the future. Yealink devices are now configured to handle 3-way conference calls like all Polycoms do. It will keep a 3-way conference call active even after the user who initiated the conference call hangs up. For your convenience, we’ve gone through and made sure all of our BETA products are properly labeled. Engineering’s gotten back to us and the ability to dial at Ludicrous Speed has been engaged for all devices via the Jive End User Portal. Please be sure to strap yourselves in when making adjustments. Yealink T41 and T42 were previously limited to supporting only 3 lines. We’ve adjusted this so they now support 6 and 12 lines respectively. Yealink devices will now engage in a touch of spring cleaning by resetting and clearing out old accounts that may have been previously provisioned but are no longer valid. We have returned from remedial Driver’s Ed and have added provisioning support and portal support for Call Park buttons on Yealink devices. This change allows you more reliability while using Call Parking. Polycom phones were having issues with assigning buttons and not being able to find their directories. We’ve since given them a few remedial lessons in delegation and not losing their phone books, and the issues have been resolved. In order to cater more to all of your organizational needs, exported dial plans include their names when they’ve saved. Word has recently come in from the lab– our cloning process has been improved so that cloned dial plans will use the same naming system as files on a computer, making them easier to keep track of. We’ve adjusted the search box so that hitting the “X” at the end will clear the search data. We’ve upped that navigational abilities of the Admin Portal by adding links to some of the drop down menus, so you’ll be able to go to the selected item’s page. For example, you can link directly to a DID’s page from the External Caller ID Drop down menu. We’ve added a link in Admin and End User Portal to the Jive Cloud Manuals. CE-LE-BRATE GOOD TIMES! You can now set up partial day holidays on your Dial Plan schedules. If the party continues over a couple of days, you can extend the holiday out as well. We’ve added a toggle on Admin Portal that’ll make your dialable password visible in case you need to check or change it. Setting the voicemail greeting messages now is more intuitive and doesn’t look funky. If, however, you want to get funky, we suggest going to the left, then take it back now, y’all. We’ve fixed a scheduling bug so the multi-day schedules you create save properly. We’ve taught the doorman in Visual Conferencing to give the right caller ID when inviting an outside caller into the call. Given that Jive Mobile, Jive Desktop, and Jive Web are all softphones and do not require equipment, we’ve removed the list of hardware that the softphone apps do not… require. We’ve gone and fixed the underlying issues that was keeping Click-to-Call from working for a few of you. Thanks so much for waiting! We’ve messed a bit with a wibbly-wobbly ball of stuff (harder than it sounds) to adjust Legacy Admin Portal’s time zones in order to ensure that it’ll sync with New Admin Portal. Fixed bug that prevented the an outbound proxy from being deleted if it was assigned as the default for the PBX. We’ve made a couple of adjustments so that when you’ve recorded a sound clip, the file name will now be saved under the correct time relative to your timezone. Changed the hyperlinked version number in the page footer so it links to the new jive.com support page. Fixed an issue where an exported Agent Summary report would be blank if it included both devices with an assigned user and devices without an assigned user would. Queues with “Deny” selected for Allow new callers into empty queue do not count calls that were not allowed into the queue as evicted contacts. This issue may be avoided by setting Allow new callers into empty queue to “Permit” and selecting “Remove Callers” for Remove callers when queue has no agents. This configuration also causes the eviction of all calls from the queue should there be a period during which no agents are logged in to the queue. Fixed a bug where totals and times in the contact center could show up as negative numbers. The Linksys/Cisco SPA 525G2 is compatible with Jive using the 525G hardware type. The Admin Portal now displays the Yealink SIP-W52P as “Yealink SIP-W52P/W56P” to indicate that the base station (and therefore provisioning) is the same for both products. There was an issue with video calling from Yealink devices to Polycom devices. This issue has been resolved. Exterminated bug related to managing Yealink T49G devices when switching between old and new portal. The hardware type identifiers were different between Legacy and New Portal. Fixed issue where paging groups with names longer than 36 characters would cause provisioning requests to break. Added “Line Selected” label on home page header section. Added toast notifications for when the websocket connects successfully. Added toast notification for when the websocket disconnects. Added toast notification for when a call log is saved successfully. Added toast notification for when there’s an error while saving a call. Repaired toaster, made sure butter and jam were at the ready. Header takes less space now. If the integration cannot detect a line that will allow you to make outgoing calls, you’ll be automatically logged out. When you first select a line, it’ll be outlined in red. Updated Start and End Date/Time to match your time zone when creating an Activity. Fixed bug that prevented the creation of a new Activity. Spayed bug that prevented opening a saved Activity on Redtail. Updated start and end date/time to use the user time zone when creating an Activity. Fixed bug where an incoming call was not showing the associated customer though the search by phone number. A new System Settings was added into Admin Portal to make call parking callback timeout configurable. It defaults to 5 minutes but, this can be changed at will. Think of it like auto-LoJacking a car. Call recordings will now have additional data, such as unique call identifiers, stored and available for upload. You have the opportunity to try three times to reach the intended extension in the dial-by-name directory. The first two do in fact count. Resolved an issue where changes to the Contact Summary page’s date selector could break the browser “back” button. Fixed issue in the Wallboard where names and icons wouldn’t line up properly with “time” and “agent name”. Resolved an issue causing people in the Pacific time zone to receive an error page when trying to load Contact Center. Resolved inconsistency of the contact resolution totals’ “Total” row on the Contact Summary Report. Resolved an issue where raw template code would appear on the Contact Summary Report for Firefox users. Resolved an issue where historic reports that span daylight savings time boundaries displayed some information with the wrong hour offset. Resolved an issue where Daylight Savings Time was preventing Contact Summary data from being displayed. Resolved an issue where users would see a blank screen instead of an “access denied” or “not found” pages. Resolved an issue where hovering off a user name or device name in the Agent Summary Report could cause a visual flicker for Chrome users. Fix an issue where the “Enroll in Jive Contact Centre” page would make unnecessary attempt to download Contact Centre data. We’ve been working hard on some internal aspects to make the app work faster and be a little easier to work with, making it easier for us to better help you. Exterminators were deployed to eliminate some bugs that, with any luck, you never even noticed were there. Polycom VVX devices now properly display duplicate lines when configured from Devices > Button Configuration Tab. Fixed a bug where Polycom devices with a corporate directory and no username or password wouldn’t provision. Resolved a bug where Yealink devices with multicast paging buttons and no paging zone selected wouldn’t provision. Some Polycom SoundPoint IP devices would reboot every night at 5pm when they grabbed their configuration files. This should no longer be happening. Some Polycom SoundPoint IP devices were hearing a “chirp” when they received a voicemail that would happen every few minutes. The parameter to disable this was different on devices with older firmware and has been resolved. Some Polycom SoundPoint IP devices on older firmware would display a full SIP url when they were receiving calls. This issue has been fixed. You may now select a paging zone for a multicast paging button even if it does not have a label. The label for the button will default to “Zone” + whatever the paging zone is. We have changed the activation button on Polycom to be a BLF (Busy Lamp Field) button rather than a speed dial button. This can attain the same functionality as before but with a BLF button it will not save to the directory, which could possibly be preserved to future configurations. Also since it’s a BLF button, it will come up with a red x on it, which is because it is not currently monitoring anything, but if you push the button it will still call *23. We’ve crafted a widget that needs to be installed in order to correct some issues with creating accounts on Salesforce via the integration. You will now be advised on what to do when your browser is no longer able to relay audio or video media. Added a Terms of Service Agreement. Input/Output settings in Jive Web will now be saved locally—so you don’t have to reselect them every time you enter the application. An error appears notifying you when a invalid character is used when dialing a phone number. Phone numbers under the History Tab have been given standardized formatting. Hopefully everyone will now be on the same page. The warm transfer button has been disabled until after both calls have been connected in order to prevent calls from being dropped. Resolved bug keeping the Warm Transfer and Cancel buttons in the Transfer menu from working. Now your calls will no longer be left out in the cold. Resolved bug concerning pasting in phone numbers. Resolved bug relating to previous numbers being called when you hit “Enter” on your keyboard. Efforts continue to try and make your life easier– there’s a “Save & Resync” button now available on the Device Detail page. Wondering how long it’s been since everything was last provisioned? There’s now a timestamp listed next to the Resync icon on the Device Detail page. The message ‘Resync request sent’ after a resync request is sent (like you do), next to the ‘Last Provisioned’ on the Device Detail page. It is now possible to configure the length of time a call can be in a call parking spot before it is returned to the device that put it there. If only finding cars in a parking lot was this easy. Added infinite scrolling when there are more than50 entries in the extension drop down menu (Devices > Button Configuration Tab). Because that is how we scroll. Made a few changes to the Admin Portal’s colors, text, etc. Enjoy the view! We’ve changed up the UI for adding and selecting hold music in New Admin portal to match that of legacy portal. Fixed an issue where external numbers could not be added to line dial plans. Resolved bug preventing the user creation wizard from working in New Portal. Fixed issue that prevented lines and devices from being deleted if a line on the device was logged into a queue. The voice prompt in a dial by name directory now says, “Enter the first three letters of your party’s first or last name” to better match how the process actually works. Resolved bug where having dashes in a listed external number would cause a given line’s dial plan to fail. Resolved bug where the “access denied” sound clip would play in English, even if the language had been changed on the PBX or line. Resolved bug where if a shared voicemail box was attached to ring group or line, you could not delete the box. Super Admins are now asked to confirm their decision when they attempt to remove their own privileges or change their JiveID. It’s a big step—we just want you to be sure you know what you’re doing. Our Dial Plan Editor has returned from summer school and now speaks all the same languages as the rest of Admin Portal adding Canadian French, German, and UK English to its repertoire. Fixed issue preventing admins from saving changes. Fixed bug where the SMS tab would be visible on a PBX even if it wasn’t enabled. When adding an agent to a call queue, lines for that agent will now display the related device (e.g. Polycom VVX 500). If the line is connected to Jive Web or Jive Mobile, “Jive App” will be displayed. Heads up: if you’ve got multiple devices of the same make and model attached to the same extension, the list might still be confusing. Resolved issue so that it’s now possible to remove someone from a conference room via their extension number. Fixed bug that caused the system to announce hold times in English, rather than whatever the selected language is. Fix issue that would prevent calls from being made if the Default Area Code was left empty within System Settings. When server-side call forwarding is enabled on a line (*72), callers routed to that line through a simple dial node are now forwarded appropriately. You can now enable and disable whether or not your phone will vibrate when calls come in through the app. Resolved bug where calls made out of “History” would fail. Resolved bug where some devices wouldn’t sound a ringtone. Infinite scrolling now available when there are more than 50 entries in the dropdown menu under Line/Speed Dial (under Device/ Button Configuration). Because that is how we scroll. Various UI improvements in Admin Portal. Bug existed where if a shared vm box was attached to rg/line, you could not delete the box. Now you can. Dial-by-Name Directory now says “Enter the first 3 letters of your party’s first or last name”. Fixed a bug where having dashes in a listed external number would cause a given line’s dial plan from following through. issue where the sound clip “access denied” would be played in english even when the language was set to non-english. Fixed issue where Panasonic devices for some international customers were provisioned to the wrong time zone. Fixed issue where Polycom and Yealink devices were provisioned to the wrong time zone for some international customers. Minor changes to the user interface (UI). Improved error alert style in the new admin portal. From a list view (devices, users, etc. ), right-click an item name to open its configuration settings in a new tab or window. Note: This does not work on lists where only in-line editing is allowed (call filters, dial plans, etc.). Infinite scrolling added to extension dropdown menus. Fixed issue where uploaded hold music files were not playing when selected on a line. Enabled test ring option for all devices within settings. This allows users to ring a line/device to test its connectivity. Automatic device selection for users with only one registered device. A line is selected or switched. Three-way calls are now supported—click the plus icon during an active call or drag and drop one active call to another. Replaced voicemail indicator bubble with plain white text. Fixed the new contact and voicemail button tooltips. Fixed issue where the history indicator was overlapping the new contact button. Users can now monitor a contact’s presence when forwarding calls. Users can now monitor contacts’ presence while in a conference call. Generally improved performance of the presence monitoring feature. Grandstream devices will now be able to dial *17. The phone was incorrectly intercepting calls to this number. Cisco and Linksys SPA devices are now able to correctly resync their configuration from the portal. Enhancements to the Panasonic TGP600 and Yealink W52P configuration to enable future automated firmware upgrades. Panasonic HDV 100, 130, and 230 now supported. Users with a mixed environment of Yealink and Polycom devices may now benefit from multicast paging that works between these devices. A new option is available on a Paging Profile to enable this feature. The VTech VSP 608 is now an officially supported device. Back Button – Red X and red hangup icons replaced by an arrow. Call Counter – Black text with yellow background. Directory and Forward softkeys added to the bottom of the screen. An assigned paging profile will affect the placement of your softkeys. Buddies and DND are found under More softkey. Paging is moved to the right and replaced with Directory. Back button moved to upper-left. On-screen keyboard button moved to upper-right. Back button is now available in each of the sub-menus. Forward is now a configurable option. Line Key Info allows you to press a physical line key to get more information about the key. Back button added to top left corner. In some cases when modifying a device in the new portal it may have caused the order of the lines to change if a line was shared on multiple devices. This has been fixed and the line ordering will remain consistent. Fixed an issue that would use the wrong permissions for a blind transfer. Resolved an issue in which it was possible to open the Real Time Queue Details page for a queue that had been deleted. Historic reports that span daylight savings time boundaries display some information with the wrong hour offset. All checkboxes across the application now have consistent coloring. Resolved an issue in which agents handling calls with multiple devices resulted in the Agent Summary table incorrectly displaying the sum of calls handled and total talk time. Resolved an issue in which data from the daylight savings time (DST) range was not displayed if the present timezone offset is standard time (ST) in areas that observe DST. After a contact is deleted, history activities for that contact show “contact not found”. Now when the user goes into a contacts profile and no messages exist the user will see a placeholder listing what is available. When no favorites exist the user will see a message telling them they can add favorites. Jive Web will now flash a quick popup when the UI starts showing the user’s selected device. Emails are now clickable in the profile and will open to the user’s native email client. Now when you have multiple contacts that match the same phone number we allow you to see both matches on the contacts page. Users can now send SMS to unknown contacts. A reset directory button has been added to Polycom devices in the new portal to enable clearing the directory on the phone. This functionality existing in the old portal and has now been added to the new portal as well. A new feature in New Portal has been added to allow Polycom VVX devices to convert to button configuration without converting their directory items into buttons. This way users can just convert to button configuration and use BLF presence buttons, but without overwriting any of their current buttons on their devices. Fixed an issue that displayed the priority and emergency paging groups on some VVX devices that were not supposed to be able to transmit on those channels. Platform admin now can turn on the flag “Allow customers to designate low-usage devices” under System Settings/Hidden tab. Then customers can designate devices as low-usage devices under Device/Device Settings tab. Once “Shared Line” is enabled, the radio selection “Use the device’s station label” under “Name” is disabled. Resolved an issue in which agents with the same name are grouped into one row in the Agent Summary Report export. The statistics displayed on the Agent Summary Report page are not consistent for some customers and date ranges. Removed the ability to launch the Wallboard page in mobile browsers as the Wallboard page cannot effectively display information on small screens. Customers can now pay their total balance with one click, rather than pay each individual invoice. Customers whose PBX was deactivated for NON_PAYMENT will now see a message in their billing portal with how to reactivate with payment of overdue invoices. There is now an option in the new Admin portal to select ‘Multicast Mega Volume’ on most Yealink devices. This will significantly boost the received paging volume on these devices which may be useful for large rooms or noisy environments. This feature if supported on the Yealink T19P E2,T21P E2, T23G/P, T40G, T41G, T42G, T46G, T48G, and T49G. The dial-now delay on most Yealink devices has been increased from 2 to 4 seconds. This should help in situations where dialing a number slowly can accidentally dial the wrong number. Devices without hardware assigned are no longer limited to 4 lines. When deleting the lines from a device that does not have configurable buttons, it will allow you to delete all lines and add new lines as needed. An issue was fixed with multicast paging. When a button is set to a multicast paging, and the paging group selected doesn’t have a label, provisioning would break and cause the word “null” to be provisioned instead. This is now fixed and will show the Zone number instead of null if there is not a label. An issue was fixed with buttons with type On Phone Defined’s labels were being overwritten when provisioned. An issue was fixed that when you converted to Button Configuration for Polycom VVX devices that it would add an extra button in portal to non-sidecar buttons. This would cause them to not provision. The Set Language node now saves correctly in New Portal. A spinner will show during the save action of an item in a list display. Fixed issue regarding no RTP Media on T-Mobile issued Android devices on the T-Mobile data network. Fixed issue where Caller ID was not properly matching a contact. Fixed issue where call notification ringtone not being played for some users. Called issue where, if a user has multiple extensions and would logout and log back in and select another extension, the previous one stays registered. Resolved an issue in which partners could not access Contact Center. Resolved an issue in which the page displayed multiple devices or stale device information on the Real Time Queue Details page even though a contact may only be assigned to an agent on a single device at a time. Resolved an issue in which the Wallboard button was not visible on mobile devices. Resolved an issue in which agents with the same name are grouped into one row in the Agent Summary Report. Until there is a change in the text field for payment receipt email address, the submit button is disabled. Issue fixed where unnecessary error message when making a payment was displayed. When zip code validation fails while saving the credit card information, it will alerts the appropriate error messages instead of ‘no detail is available’ . Our provisioning service will now set the appropriate hardware model on a device when the device checks in the first time. This will enable the phone to automatically update the view in the administration portal to show the proper number of buttons and configurable options after the device provisions. An issue was discovered while disabling button configuration on Polycom VVX devices in the new portal. If you unchecked ‘Use Jives button configuration’ all lines would be removed from the device. This has been fixed and you can safely convert between using button configuration or line-only configuration. Our provisioning system was not honoring the ‘disable configuration retrieval’ option that can be set in the administration portal for Polycom VVXs and Yealink devices. This has been fixed and the system will no longer send updated configuration for devices that have disabled configuration retrieval. When using the device combo wizard in the new portal, the information needed to ensure presence notifications work may not have been updated correctly. This has been fixed and all new devices created using the combo wizard will have the proper presence information saved. For customers using the Corporate Directory feature on Polycom phones, the corporate directory was not able to search for directory entries using the attributes defined in the admin portal. This has been fixed and you can now search for entries in your corporate directory from the phone using first name, last name, and all specified telephone number attributes. A bug fix has been applied for the issue of lines reversing their order in new portal, even though old portal showed the lines correctly. Now both New and Old portal display correctly, and provisioning is also correct. New Portal parity that provides and improves the parity with the old portal in terms of Voicemail and Voicemail Access tab under Line/Ring Group/Shared Voicemail Box. Fixed issue where certain numbers in Brazil could not be dialed without dialing its country code. Made the adding/removing ring steps work in Line/Dial Plan tab. Resolved an issue in which the formatting of phone numbers for display caused errors in the user interface. Fixed an issue in which the Agent Summary Report displays all agents’ calls instead of just the selected one. Resolved an issue in which some notifications would obscure important page content on mobile devices. Resolved an issue in which the Launch Wallboard Selector, accessed via the Launch Wallboard button, did not display a shadow. Safari is now a supported browser for Billing Portal. Now users can logout or navigate to admin portal from billing app. When Invoice details page has more than 25 lines, pay now dialog box is always visible. No longer displays unnecessary error message when making a payment. Several minor changes have been made to the Yealink configuration that will fix some issues with button configuration. One particular issue was that call parking spot keys were not always provisioning correctly on the phone. This has been fixed. Yealink T26 and T28 devices with memory keys have been fixed to provision correctly. The buttons on the first sidecar in the portal will be used as the memory keys on the device. When a user enables ‘Show Conference Phone Numbers’ on the portal, all phone numbers routed to this conference will show up. Billing Permissions can only be modified when the billing feature is enabled on the pbx. When using Safari, a prompt will appear directing the user to press ⌘+C to copy the conference bridge link in both the conference bridge list and the general tab. This prompt will also appear when the user needs to copy the username/password in the Device/Hidden Options tab. Fixed presence monitoring issue where a user would be shown as busy incorrectly while being invited into a conference through the portal. Fixed presence monitoring issue where a user would be shown as busy incorrectly while being transferred. Login issue where some Samsung models running Android Marshmallow 6.0.1 are getting “400” error messages when trying to login. Phone contacts now shows under contacts. If you are running Android Marshmallow, make sure you gave the Jive App permission to read your phone contacts. The Agent Summary Report export now displays the name of the user, the agent, and the device that handled a contact. Statistics are grouped by the user when available. Resolved an issue in which data was displayed in the UTC time zone which made certain data sets appear on the incorrect day. All data is now displayed based on the browser’s time zone setting. Removed outdated pricing tiers from the Account page. Resolved an issue in which the Wallboard failed to handle long agent names correctly. Now long agent names can wrap to two lines if necessary. Resolved an issue causing agent names to overlay the date range selector. Added a tool tip to show multiple agent names and multiple device names when available. Changed the Agent Summary Report table to group by agent when available. We have updated our firmware management process to enable new customers to receive the latest qualified firmware for their devices rather than using the oldest qualified firmware. This will ensure new customers receive the latest and improvements without having to wait for or request a firmware upgrade. Fixed a bug with sidecar keys on Yealink not provisioning correctly. If the device has Memory Keys, extra keys that show up on the physical device that almost look like keys on a sidecar, you currently will use the first sidecar section to add those keys, and then the first actual sidecar will be provisioned starting on the second sidecar section. If the device does not have memory keys, then the first sidecar is used to provision the first sidecar, and so on. Portal is now supported on IE 11. However, launching ‘Visual Conferencing’ directly on IE 11 is not supported yet. When the domain is not jive.com, Visual Conferencing and links to Contact Center will be hidden. Calls toward Jive’s platform on a SIP trunk now properly include the Caller ID. Fixed issue that would prevent sound clips and hold music files from being played again after initially being played. New font for the whole application, better look and more readable. New icon colors indicating the call direction, even on an active call. Better experience while selecting a backlog call. Better experience with the buttons new look and colors. Incoming/Outgoing indicators with animated gif. Legacy Salesforce app has been taken down; links on how to update are listed for those who haven’t updated yet. Top right app menu there is now a list of the user’s devices to select from. All calls will be shown in Jive Web; calls will however only be made in Jive Web unless another app has been selected. When the user clicks to call voicemail now the dialer is automatically pulled up. Now when the user search to transfer there is a “VM” button next to the contact to send them directly to Voicemail. Resolved an issue in which documentation links for Contact Center directed the user to inaccessible documentation pages. Agents that log in to queues using more than one device (hardware phone or software phone) appear twice in the Agent Selector with no means to tell the difference between the two appearances. Firmware upgrade: All Cisco and Linksys SPA 502g, 501g, 303, 509g, 508g, 301, 504g, 512g, 514g, 525g devices for customers with 100 devices or less have been upgraded to version 7.5.7. Firmware upgrade: All customers with less than 100 Yealink devices have been upgraded to the latest firmware. This includes several and improvements. New functionality will be enabled on devices on this firmware in the future. Aastra model names have been adjusted. Each model is now referred to with its full model name. Example: the 57i is now expanded to the full 6757i model name. Visual Conferences no longer necessitate a participant PUN after a host PIN is set. Fixed configuration issue that broke Shared Voicemail Boxes if modified from the new Admin Portal. Fixed issue where on the host view of conferencing UI, the texts for the conference room actions are only shown when hovering over the icons. Added support for reconfiguring the Wallboard page on a Chromecast without needing to use the Chromecast extension button to stop casting before casting the new configuration to the same Chromecast. Resolved an issue in which the Launch Wallboard button was obscured on the Real Time Queue Summary page in Firefox. Resolved an issue in which the Launch Wallboard button menu failed to display in Firefox. User can now set customized time for their call history to clear out via Settings in increments of 1 Hour, 2 Hours, 1 Day, 2 Days, and 1 Week. The search bar has been moved to the left sidebar and will now be positioned under calls and above the two tabs on the left side. Users can now go to the audio settings tab and scroll to notification sounds to select the sound played while receiving a text notification. Users can now see a voicemail waiting indicator showing the number of waiting missed voicemails. When clicked, the user’s voicemail will automatically be called and a dial pad shown. Fixed issue so that the greeting no longer says “Good morning” in the afternoon. Many minor bug fixes relating to improving the user’s experience in dragging and dropping transfer calls. Updated the application error pages for the public beta. Resolved an issue on the Abandoned After Threshold Report in which the graph did not resize correctly. Added functionality to launch the Wallboard page in a browser window for customers without a Google Chromecast. To change the current Wallboard configuration when already displaying the Wallboard page, users must manually stop their current casting session to the Chromecast. A badge now appears above the Voicemail button to indicate how many voicemails the user has waiting. Clicking on “Voicemail” now initiates a call to *99 to take the user to their voicemail inbox. Users can now dial out from their keyboard instead of just using the dial pad on the screen. Fixed issue regarding half second delay between dialing and a call being placed. Fixed issue where an outgoing call in History would duplicate when rejected. Fixed issue where a call would be forced off of hold while a second call was being placed. Fixed issue regarding missed calls being miscounted and listed incorrectly. Fixed issue regarding toast notifications incorrectly routing the user. Fixed issue regarding a call on hold being taken off of hold when beginning a warm transfer. Vtech devices now have LLDP-MED enabled by default. This allows for discovery on the network. Several customers on the new firmware are having issues with the new failover parameters that were enabled when they have a transparent SIP proxy. We fixed one of these by disabling the onlySignalWithRegistered flag but reRegisterOn is apparently also causing issues. The user may now select any type of extension (including Ring Groups, Conference Rooms, and others) as a speed dial entry without having to look it up and type it in as an external number. This change also fixes some Polycom devices that were converted to button configuration and happen to have these types of extensions already added as speed dials. The portal now displays these types of buttons correctly. Vtech devices were having an issue with displaying their time correctly. This was due to a timezone misconfiguration. This has been corrected. When adding and removing lines on a device in the new portal some configuration affecting presence information could have been incorrectly updated. Now whenever adjusting lines on a device in the new portal the presence information will be correctly set and will fix any inconsistencies that currently exist. An issue was introduced briefly that prevented non-Polycom devices from adding Speed Dial w/ Presence buttons to their device in the portal. This issue has been fixed and you can now correctly select Speed Dial w/ Presence as the button type again. Some Yealink and Polycom devices were unable to retrieve their proper configuration from our provisioning service. Some of the newer changes in provisioning may not have been available such as button configuration on Polycom devices. This affected only a small subset of customers. The issue has been addressed and the devices should now be able to retrieve their proper configuration. Caching is implemented in Admin Portal Client to improve performance. Users cannot currently play media on Admin Portal while using Edge. Visual Conferencing is not currently supported by Edge. Fixed issue where timezone drop down menus did not show any timezones. Fixed bug that prevented some extensions from being updated. Fixes issue where dialing without country and area codes when a line’s region differed from the PBX region would fail to complete. Added a Wallboard page targeted at 1080P televisions used as an information radiator in a contact center. The Wallboard page provides key performance indicators and SLA compliance indicators for one or more queues. Improved the general load time of the application across browsers. Fixed a reported bug where some users were being consistently logged out while running the application in the background. Updated the Account page to reflect the new effective date for pricing. Updated column headers on the Real Time Queue Details page to be consistent with the terminology used elsewhere in the application. Fixed an issue in which the Agent Selector and Queue Selector were displayed incorrectly in IE. Updated button titles to be consistent across the application. Updated button styles to be consistent across all buttons in the application. Call history is now kept on a per computer/browser basis, and is shown under history on the left side. Transfer icons changed to text when transferring calls. When users return to the invoice list page, it takes them to the page number they had selected. Previously when upgrading devices on a domain, if any devices were added in the future they would be on the old firmware. This change fixes that so new devices will be on the new firmware. There is a new option for selecting between Buddy Watch and BLF presence button types in portal for Polycom VVX devices. Polycom devices that are on our latest supported firmware will now benefit from a more stable failover between outbound proxies. Vtech devices were receiving an incorrect path to their firmware file. This is now resolved. There is now a way to update all presence button types in portal to be either BLF or Buddy Watch. This was implemented initially for allowing customers to get around the BLF beeping issue, so customers who want to revert their buttons back to Buddy Watch so they don’t hear the Call Waiting beep. This feature allows them to change all their presence buttons at once. Added new feature that allows admins to setup an IP address that all outbound proxy requests will go through for a PBX/device. This replaces registration proxies and will allow for the usage of JBC equipment at customer sites. The proxies are created in system settings in new portal under the Outbound Proxy tab and consist of an IP address, a name, and the protocol to be used. When creating/changing an extension number on Line and Conference Bridge, reserved numbers from the related regions, which are the union of region of the pbx and all extensions, are not allowed. When changing the region of PBX, the system will check whether any existing extension number is a reserved number in the new region. A warning will display if this is the case. When changing the length of the extension digits, the system will check whether any new number is a reserved number and a warning will display if this is the case. Modified description typo in the Admin Portal queue section from “Allow new callers to empty queue” to “Allow new callers into empty queue”. Fixed issue in Visual Conferences where mute button was showing who was muted inaccurately. Fixed issue in Visual Conferences where Host was kicked out of a conference automatically. They now remain in the conference until they choose to log out. The Agent Summary Report now lists statistics grouped by agents rather than by time. Fixed an issue in which SLA indicator icons were obscured on the Real Time Queue Summary page. Fixed an issue in which the breadcrumb changed position on navigation between pages. Fixed an issue in which the Queue Selector was nonfunctional in the Firefox browser. Fixed an issue in which customers not participating in the beta still generated requests to Jive while viewing the error page. The Queue Selector is nonfunctional in the Firefox browser. The Queue Selector and Agent Selector are nonfunctional in the IE 11 browser. Added functionality so that when a user is logged into two devices at the same time, and reads a sms message on one, it is marked as read on the other. User can add Favorites and subscribe to different contacts at will. Fixed issue regarding the app crashing when trying to delete a contact. Fixed issue where messages were not being marked as read after having been viewed. Fixed issue where memory issues would cause the app to crash while in Messages. Fixed issue with audio on iPhone 6S models. Mixed-case usernames can now log into newer applications. Users can now switch which speakers audio comes out of. This can be done in call or from the settings menu. Call history now being kept on a per computer/browser basis. It shows under history on the left side. User can now switch the input and output for mics via the Input/Output tab under “Settings”. User can click the gear icon on the profile page of the callee to change this setting for that call alone. We accept partial payment on invoices. If full amount is not paid before the due date, it counts as overdue. Added support for centrally provisioning and configuring new Polycom VVX 301, 401, 501, and 601 devices in the portal. Added support for configuring per-device and per-pbx outbound proxies. The new outbound proxies may be configured in the new portal. For existing Polycom VVX devices using line-only configuration there will be a new checkbox in the new portal allowing the user to switch from line-only configuration to full button configuration. This process will take the known directory entries that would show up as speed dials on the phone and convert them in to buttons automatically making the process to convert to button configuration much smoother. Some Polycom devices had trouble generating their extension or directory files when using the new provisioning service when the stored directory had multiple entries using the same speed dial number or contact number. This may have caused them not to get their correct button configuration or directories. These types of directories are now handled correctly and duplicate entries are pruned in order to generate a proper configuration file. Several Yealink devices were previously given incorrect paths to retrieve and upgrade their firmware. This has been fixed and the devices should now be able to get their firmware. This may result in some devices changing firmware versions if they were not already on the Jive supported version. Some Yealink T23G devices using factory default firmware were not able to retrieve their configuration. This has now been fixed and all T23G devices should be able to retrieve their configuration. A convert button has been added to portal that allows a customer with a Polycom VVX device to provision using Button Configuration, allowing them to place buttons wherever they want to on the device. This button also has a revert mode to it, where it will take the device back to lines only, just in case they desire to go back to old functionality. Portal is now supported on IE 11. Launching ‘Visual Conferencing’ directly on IE 11 is not supported yet. Portal is now supported on Safari. Media play (hold music, sound clip) is not yet supported on Safari. A popup will shown to inform the user of this limitation. Added new feature that allows admins to setup an IP address that all requests will go through for a PBX/device. This replaces registration proxies and will allow for the usage of JBC equipment at customer sites. The proxies are created in System Settings in New Portal under the Outbound Proxy tab and consist of an IP address, a name, and the protocol to be used. Updated the management component used to grant access to the beta in preparation for open beta. Contact Details Export and Agent Details Export may contain duplicate rows for exports containing more than 100 calls. User can now go into the settings menu from the top right app menu and see a tab called “Audio”. From there the User can select a ringtone and the volume for all sounds. Some Yealink W52P devices were unable to retrieve their configuration for a while. This has been fixed and they should be able to retrieve their updated configuration. Customers can now choose to play ringing or hold-music for callers waiting in queues. Added ability to lock and unlock the conference bridge in Visual Conferencing. Fixed issue with scrolling through hold music playlist. Added link to Visual conferencing on the Conference Edit page. Added ability for user to use their keyboard to select items on searches. Fixed button labels for changing languages in new Portal. Fixed issue that didn’t allow New Portal to load PBX ID with “/” listed at the end. This should work fine now. Fixed Drag-and-drop feature for hold music in Firefox. Fixed music player control progress slider in Firefox. Fixed issue with new proxy under System Settings’ Proxies tab so the PROTOCOL selector would show UDP default. Fixed Save Button issue when creating new proxy so it responds properly. Fixed Proxies Tab under System Settings where PROTOCOL would display error. Added the “Monthly Minute Average” widget to the Account page to display the average minutes used over the previous three complete months. Added ability to test and delete duplicate endpoints the Extension. Refresh list after is deletion is complete. Enforced boundaries check for all windows. When a call is missed the browser tab will now display the number of missed calls next to the application name, ie “(3) Jive Web”. All VTech VSP715/725/735 and 600 devices should now be on firmware version 1.1.1.1 which provides bug fixes and additional features. Some Panasonic devices may not have been upgrading their firmware correctly. There was an issue identified in the configuration parameters sent to the phone which has been fixed and firmware upgrades should happen correctly now. Yealink time zones were incorrectly configured for a few days. This issue has been fixed and times will now show up correctly. Added the Account page with a monthly minute counter. The account page is only available to administrators. The monthly minute counter show the current monthly usage of Contact Center from the beginning of the month. Added the Contact Center pricing list to the Account page. The price list is meant to give users an idea of what their costs will be once Contact Center leaves beta. Added the Agent Summary report for a limited set of beta customers. This report will be enabled for all customers in the near future. Fixed an issue where the page icon of the Management page did not match the icon in the site navigation.Fixed an issue that caused the feedback tool to appear over the apply button of the Agent Picker on the Agent Summary Report. Fixed an issue where extra white space appeared in the mobile view of the AAT Report. Fixed an issue that caused the text color of a timed out contact to appear in low contrast with the surrounding background color. Fixed an issue in which agent names were not always sorted alphabetically in the agent selector on the Agent Summary Report. Fixed an issue where the Agent Summary Report indicated an average talk time of 00:00:00 when no data was available. Fixed a bug in which agents with only missed calls were not showing in the agent selector on the Agent Summary Report. The T49G has been added to Jive’s centralized provisioning service. See the supported phone feature matrix to determine which features are supported. Added ability to turn off button configuration on a VVX device in order to go back to using basic line configuration and manual buddy list management. This is available in the new portal only. This is a one time change. After you switch to line based configuration you will need to delete the device profile and recreate it to use button configuration again. VTech Firmware 1.1.1.1 is now available for the VSP 715, 725, and 735 phones. To upgrade just reboot your device and it will update to this version. Some Polycom VVX devices may have had incorrect labels applied to speed dial buttons. This has been fixed and the labels should be correct now. User can now add, delete, view and search for personal contacts. Added the ability to add multiple email addresses for outbound E911 email notification. Up to 10 email addresses. Generate region-specific ringback tone for UK, Germany, France, and Spain when that region is selected for the extension. Admin pin must be saved successfully before conference link is shown. Fixed issue where when a user deletes an extension of an agent of a call queue. It is now flagged on the pop-up list of referencing entities. Notification at the top of the app now visible when WebSocket connection is lost. Users can now have multiple tabs open at a time and see active call reflected on each of the tabs. Users can now sync discarded items throughout all the open tabs. Users can now focus on active call not allowing them to toggle between calls when on an active call. User can now view, favorite, search and scroll personal contacts. Added minimize button to main window. Added a “BETA” label to the product branding. Updated the “Beta Terms of Service”. Fixed an issue where historical report graphs sometimes omitted the last data point. Fixed an issue where customers could not access Contact Center via “https://my.jive.com/cc”. Added ability for the User to switch between mic and speakers mid-call. Added ability to “Favorite” contacts. Bluetooth control: User can tap the “speaker” button while on a call to toggle where they want the audio routed (e.g. Bluetooth, Speaker, Internal, etc). Favorited contacts are now grouped in separate list under contacts. User can now interact with the contact detail by calling, sending a chat or sms, or opening an address in the a mapping application. User can now favorite or unfavorite a contact which in turn will show under the favorites list. User can now tap on a notification and would be directed to the proper conversation within the app. User can now call and message from favorites. User can now tap on “call” or “chat” in a contact’s details page. Removed Call Forwarding option for Geofencing. User can now view favorites by swiping right. User can now mark contacts as Favorites for iPhone 5 and up. Notification now shows when a new update is available. Fixed issue where duplicates or contacts no longer existing in the PBX appeared in the app. Fixed issue where app was not synchronizing contacts with the PBX. Section Titles removed from Contacts. Fixed issue where when the app received a second call while already on a call and would turn on the speaker. Fixed issue where phone would vibrate when sending a message. Fixed issue where app would crash when a user would try to send a chat message to a user no longer on the PBX. Fixed issue where app would crash while trying to scroll in History while the keypad was still open. Fixed issue where keypad sometimes not dismiss while in Contacts. Fixed issue where User could not tell which ring tone was selected. Fixed issue where the Ringtone was being routed to the Receiver on an incoming call. Fixed issue where “Add Contact” was appearing in Favorites view. Fixed an issue where some customers that have used the new admin portal to set super admin permissions experience difficulty accessing the application due to permissions. Fixed an issue where some customers experienced missing Caller ID information in the real time views and Contact Details exports. Fixed an issue where partners cannot access the application due to permissions. When receiving a message in Jive Web now a badge appears next to history showing the number of unread messages currently in the queue. On the Dashboard view, when typing in a phone number or extension, the user can press enter to automatically place the call and take the user to the profile view for that contact. There is now a record of all calls that have come in and out from your Jive phone. On the top right in Jive Web is now a bell icon. After a call has been connected, click this icon and a drop down will appear with your call history. User can reject an incoming call to send it straight to voicemail. Line ordering when you have more than 11 lines on a Polycom VVX has been fixed. Speed Dial With Presence buttons may have appeared in the wrong order on some Polycom VVX devices. This has been fixed and the buttons will now appear in the correct order. Add languages in Conferencing UI: French, French Canadian, German , UK English, Spanish. US and Canada: no out-dialing to area code: 284, 649, 809, 876, 900. Germany: no out-dialing to prefix with 1, 700, 701, 800 and 900. Spain: no out-dialing to prefix with 6, 7[1-9]), 80[0-9], and 90[0-9]. France: no out-dialing to prefix with 6,7,8,9. United Kingdom: no out-dialing to prefix with 7, 8, 9. Fixed the way to set the Speed-Dial button on Device/Button Config page. Limit out-dial to just the same region/country. (CLARIFY). Fixed an issue where column alignments were inconsistent across pages. Some partners experience issues accessing the application due to permissions. Some customers experience missing Caller ID information in real time views and Contact Details exports. Jive Desktop Beta released to general availability. Fixed issue regarding favorites not showing up. Fixed issue regarding login error. Added the tracking of agent wrap time when configured for individual queues and improved the consistency of wrap time tracking between agents and contacts. The data in the table of the Contact Summary Report is now listed the the most recent time frame at the top of the table. Added an error page that informs users that the Contact Center reports on the usage of queues, but that the customer has not configured any queues. The page directs users to the documentation for configuring queues. Added a preset “Today” button to the date range selector on historic reports. Fixed an error that was causing call queues to erroneously report extremely high numbers of calls in queues. The year was not fully visible when using Microsoft Edge browser. Centered the vertical alignment of the icons in the right drop down menu and the left side slide out menu. Constrained the width of the new version notification so as to not unnecessarily block a significant portion of the screen. Contact Details exports are missing Caller ID information. Users not yet authorized to use Jive Web will be given a link to email in order to request an invite to the Private Beta. User can now configure Line Silent buttons on Polycom VVX devices that use button configuration. User can now configure Speed Dial buttons on Polycom VVX devices that use button configuration. Yealink clocks are now properly adjusted to account for daylight savings time in all timezones. Added localized language support for international customers using the portal web site and voice prompts. Added Super User tag to user view in new portal. Fixed the way how customer can set the Speed-Dial button on Device/Button Configuration page. Added ability to set the dial-out region on an individual extension rather than just the PBX region on Visual Conferencing. Resolved a bug where exports from the Contact Summary Report intermittently excluded data from the end of the export or otherwise failed. Fixed an error which prevented links from the user feedback tool from functioning properly. Fixed an intermittent issue where historic report data was inconsistent between page loads. Updated the upper right navigation menu to only display the link the the administration portal for users that can access the administration portal. Portuguese language support has been released as part of version 1.2.9 to the Chrome Web Store. Customers are now able to see a call direction indicator that tells them the direction of the call (outbound/inbound), in both History tab and Backlog items. Outbound : Arrow from left to right. Inbound : Arrow from right to left. Users can now customize the app’s size. App has a new menu including Settings and Quit. Resolved User Experience (UX) issues around closing required windows. Resolved User Experience (UX) issue where Win7 users couldn’t grab the favorites sidebar. Users now can toggle the “Show favorites sidebar” without being redirected to the main page. Fixed issue where the program window appeared offscreen. Minor tweaks to Contacts and Sidebar styles. User can immediately begin typing when a contact window is opened. Improved consistency of terminology across different pages. Fixed unexpected behavior in the queue selector when selecting last unselected queue or unselecting the last selected queue. Updated the threshold input on the Abandoned After Threshold Report to prevent the use of invalid values such as negative numbers. Improved the consistency of tabular data alignment across different pages. Exports intermittently fail for some users. Region now can be set on Line/Conference Bridge. Admin Users Customer can now view unavailable lines. Added ability to copy conference link or launch conference after selecting a conference bridge and then selecting the “General” tab. Added easy-to-reach Feedback ability in Visual Conferencing. Added filter to prevent recording upload service from creating subfolders (i.e. – folder names containing a ‘/’). Fixed bug where Visual Conferencing would require a pin for someone to join a conference, even if the Host had stated otherwise. Update the breadcrumbs in real time navigation to provide a more consistent experience. Added additional columns to the Contact Summary Report. Improved performance on historical reports and exports. Added contact resolution totals to the Contact Summary Report. Added a daily contact resolution totals to the real time queue details view. Removed the raw data export from the Average Speed of Answer, Contact Resolution, and Abandoned After Threshold Reports in favor of the all inclusive export available on the Contact Summary Report. For historical reports featuring aggregated statistics for a time increment, the time increments automatically scale depending on the selected date range. Less than 2 days yields 15 minute increments. 2 days up to but not including 7 days yields hourly increments. 7 days or more yields daily increments. Fixed confusion around the boundaries for changing size of the time increment in the historical graphs and tables. Fixed a recurring issue in which the historical report graphs would shrink after interacting with the controls for the report. Fixed an issue that rendered the threshold input on the Abandoned After Threshold Report inoperable. Improved ability for user to toggle between calls. Fixed issue regarding logging out. Fixed issue regarding call notes not logging properly. Fixed issue where a call’s matching account would only appear when the call ended. Fixed issue where multiple old calls would be discarded. Fixed issue regarding multiple account matches. Improved User Experience regarding window management. Improved navigation through Settings page. Blocked the ability for Visual Conferencing to be used to out dial to a cell phone in Mexico and Brazil. In Visual Conferencing, we changed prompt from “You have been kicked from the conference” to “You have been removed from the conference”. Participant will be able to use Conference UI even there is no pin for participants. Added ability to select extensions in Line Dial Plan as the next step for ‘If no answer, send to:’ or ‘If call fails, send to:’ scenarios. Resolved issue with inline call filter editing where description was not always being saved. Added the initial Contact Summary Report and export to the user interface. The user interface provides overall and incremental statistics including the ASA (Average Speed of Answer), ATT (Average Talk Time), and AHT (Average Handle Time) for the selected queues and date range. The export provides a CSV file containing overall and per-queue statistics as well as details of all contacts made through the selected queues during the selected date range. Fixed the version number link in the page footer so that it is visible and clickable when viewing the application with a narrow (mobile) screen. Fixed the alignment of values in the real time “All Queue Activity” table when viewing with a narrow (mobile) screen. Fixed the left and right alignment of header bars when viewing with a narrow (mobile) screen. Fixed a horizontal scrolling issues in Firefox. Fixed the left-right padding on the historical report pages when viewing with a narrow (mobile) screen. Removed extra whitespace on certain historical reports pages when viewing with a narrow (mobile) screen. Fixed issue regarding duplicate call pops. Fixed issue where calls weren’t showing in the backlog. Fixed issue regarding backlog items not being created properly. Improved ability to switch lines while in Jive Desktop. Fixed error regarding favorites not loading properly. Improved styling and navigation that is consistent with other Jive applications. Moved the main site navigation to a mobile compatible sidebar. Improved iconography, colors, and controls. Improved behavior on smaller screens (mobile). Added a real time clock display on real time views. Took preventative measures to prevent future problems with alert updates. Fixed the broken documentation links. Fixed issues with obstruction of the SLA alert indicator on smaller screens (mobile). Log outbound calls feature added for Redtail Integration. Log calls as Activity or Notes feature added for Redtail Integration. Geofencing feature released and no longer in BETA. Chat feature released and no longer in BETA. SMS feature released and no longer in BETA. Extension to extension video feature released and no longer in BETA. Resync icon updated to be more consistent with the old portal. Note: resync will only be allowed for phones that allow this feature, and have a currently online associated extension. Added ability to copy conference link or launch conference after selecting a conference bridge and then select general tab. Customer Feedback option added to Visual Conferencing. Fixed bug where popup text covers up mute and hang up action buttons in Visual Conferencing. Fixed mute/unmute functions in Visual Conferencing. Fix the permission checking for the Portal menu item. Now all those with access to manage the PBX will see the Portal link in the upper right menu of Contact Center. Removed the management tab from view for those that do not have permission manage the settings contained therein. The date range selector now toggles open and closed when you click on the date range label. This feature works in both the desktop and mobile views. There is now a link to the administration portal from the top right navigation menu. The link only appears if the user has the proper permissions to access the administration portal. Fixed an issue where customers who were added to the beta, removed from the beta, and then added again, could not see the agent attending to a contact in the user interface. Fixed the display of the date range selector in Edge, IE 11 and Chrome running on Windows. Numbers in input fields are no longer truncated. Fixed an issue in which the user interface could use outdated credentials to access information, resulting in a degraded user experience. Resolved an issue in which exports with a large number of rows were truncated or would fail to download. Updated the user interface to work with the latest back-end services in order to move to a more consistent interface to the back-end services. When a new version of the user interface is deployed, a notification dialog appears in the lower left corner of the screen. The notifications informs the user that a new version is available and includes a link to refresh the window. If no action is taken by the user, the screen will automatically refresh after 2 hours. Resolved inconsistency of the “total-duration” column in historic report exports. The column has been replaced by the “total-duration-on-entry” column representing the overall age of the contact at the point in time it entered the state represented by the row in the export data. Added a link to the user documentation in the upper right navigation menu. Linked the version number in page footer link to the release notes. Unable to scroll the terms and conditions page to access the accept button in mobile browsers. Fixed navigation bug for collecting user feedback from the terms and conditions page in mobile browsers. Fixed issue with the date range selector not formatting properly in mobile browsers. Exported data from the History views is now sorted consistently. Historic reports group data points by call start time in order to enable more accurate reporting of when staffing adjustments are needed to correct customer experience issues. Configurable thresholds for queue depth / unattended contact count and visual notifications on the real time queue summary and real time queue details pages. Updated iconography and color scheme to support visual notifications. Fixed a bug which caused the withdraw of non-terminal contacts from the UI to render the UI inoperable. A non-terminal contact is usually only withdrawn due to issues on the server side. Fixed a bug where navigating to the Contact Center UI when feature has not been enabled caused unneeded background requests. This fix reduces the load on the servers. Fixed a bug which caused evictions to be reported incorrectly in historical data. Fixed a bug in the queue switcher where queues were not being selected properly. Updated “longest talk time” counter on the Real time page such that longest talk time no longer includes wrap time. Fix text rendering of queue names in the queue switcher. Fix scroll bar in the queue switcher.